It seems that we inevitably return to the discussion of the weather, but when the sun shines, we suggest declaration of a holiday, a jaunt to the beach or lido, sunning in the park or finding enjoyment on the shoreline. Traditional and unconventional opportunities to get sand between your toes and water up your nose await. 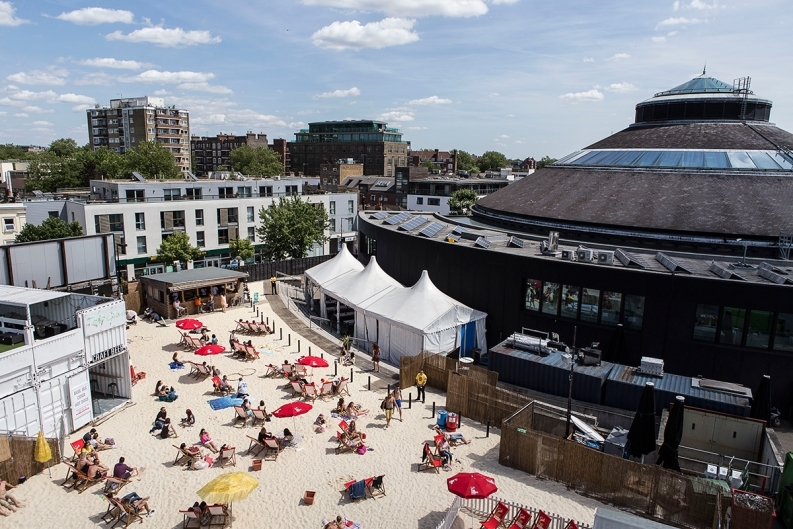 Get ready for the return of Camden Beach to the Roundhouse, the fab arts venue in Camden, for another year bringing practically everything associated with a beach holiday in England to central London. The terrace will be filled with 150 tonnes of sand, pop-up restaurants, bars, deckchairs, beach huts, raucous laughter and the opportunity for people watching. Opening times for this manmade experience vary, but historically have run for several weeks through the peak summer months. Exact dates will publish soon, so plan to get there early as it tends to draw a crowd. Families can make a day of it, so bring your buckets and spades, but beware, the party can get hardy and leans to kid unfriendly towards evening. The dank mudflats of the Thames are probably not the sunny beach venue that you imagine soaking in, but they do offer a rather unique shoreline experience, ‘mudlarking’, when the tidal river withdraws. Find yourself among amateur archaeologists scavenging treasures cast away from cargo boats and river workers that transported items from all over the world for centuries, continuing to reveal items from London’s past just under the surface of the muck. London’s history as a world port dates back to the Roman era and the Thames mud is anaerobic, without oxygen, so things don’t decay, making it possible to find preserved medieval treasures even today. To dig below the surface, a license issued by the Port of London Authority is required, but to explore and find things on top, a pair of waders, some patience, and time to kill are the only tools necessary. Licensed mudlarks dig on the foreshore in exchange for having their finds officially recorded by the Museum of London continually building a record of life on the river. The selection for lidos or open-air swimming pools where one can satisfy their lust for laps, wash off the Tube, or train for the next triathlon they learned about at the The National Triathlon Show at Lee Valley Velopark in April abound in Britain. 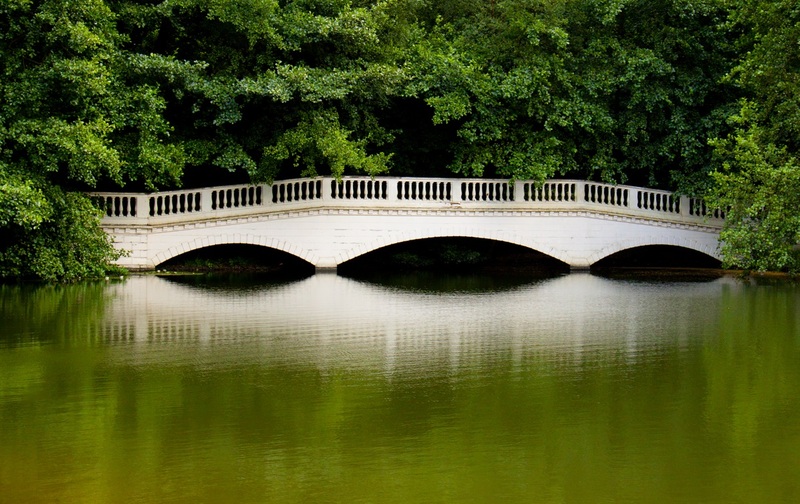 Hampstead Heath’s three swimming ponds and the Serpentine in Hyde Park offer non-chlorinated alternatives to improve one’s breast stroke and refresh their senses, while Charlton Lido’s 50-metre outdoor pool is heated, extending the outdoor swimming season beyond the summer months. For those not keen on the idea of being seen in a swimming costume, but interested in swimming for sport nonetheless, The London Aquatics Centre will play host to the 2016 European Aquatics Championships. The events which feature swimming, diving and synchronised swimming will be held at the centre within the Queen Elizabeth Olympic Park and will be the first major event to be held at the Olympic pool since the 2012 Games. Britain’s Jurassic coastline activities boasts areas steeped in history and geographical significance and attracts over 500,000 curious travellers every year fancying a walk on the beach, primarily during the peak summer months of July and August.You’ll find coves and beaches all along the coastline. Visit Lulworth, a great starting point from which to walk the South West Coast Path, England’s longest waymarked long-distance and a National Trail stretching 630 miles. The path climbs out of Lulworth quickly, but gives views of the cove below as you climb continuing to the top of Dungy Head, passing the Man O War Cove. As you reach the top, get views of Durdle Door, one of the most photographed views of the coast path. The beaches are brilliant, and there are steps down to both Man o War Cove and Durdle Door beach after which the path climbs steeply away. If you continue on as far as Bowleze Cove walk on the beach into Weymouth where there’s a holiday resort and beach with soft sand and sea for swimming. Blackpool Pleasure Beach delivers a stimulating day with the UK’s award winning theme park featuring 125 thrill rides, attractions, and legendary stage shows. Ken Webster, mentalist, hypnotist and entertainer is on stage at Pleasure Beach starting this spring with award winning magician Russ Brown’s Carnival of Magic and Hot Ice 2016 - 80th Anniversary Production gliding into town later in the year, with glamorous costumes and showmanship from a cast of world championship performers. Images: Camden Beach At The Roundhouse - Photo by Stuart Leech; Hampstead Heath - Photo by Azem Kola. Okay, guilty as charged. I’m an unrepentant Shakespeare groupie, dating from age 17 when I saw my first professional production in New York City. In the years that followed, I’ve managed to see and/or read 36 of the 38 plays attributed to him. So it is no wonder that I’m having a dinner party on April 23rd to celebrate his birthday – which also happens to be the date on which he died, exactly 400 years ago. Although there is no actual record of his birth, there is a record, in Holy Trinity Church, Stratford, of his baptism, which was April 26th, 1564. Back then, baptisms usually took place three days after a baby’s birth, which is why it is assumed that William Shakespeare was born on April 23rd. Because 2016 marks the 400th anniversary of his death, there will be many celebrations around the country, especially in Stratford-on-Avon. (As it so happens, April 23rd is also St. George’s Day. How clever of Britain’s most famous playwright, with a dramatist’s sense of timing, to organise both his birth and death on the anniversary of the patron saint of England). There is a fair amount of controversy regarding the authorship of the plays, and a lively group of naysayers, which includes actors Mark Rylance and Derek Jacobi. I’m definitely in the camp that gives Shakespeare full credit for 38 plays and 154 sonnets. In my mind, their enduring popularity is attributable to their portrayal of timeless, universal truths: jealousy, love, loyalty, political intrigue, ambition, revenge, betrayal, redemption, lust, regret – all so very human. Shakespeare was born and raised in Stratford. His father, John, was a town official and a glove maker. His mother’s family, the Ardens, were landowners. 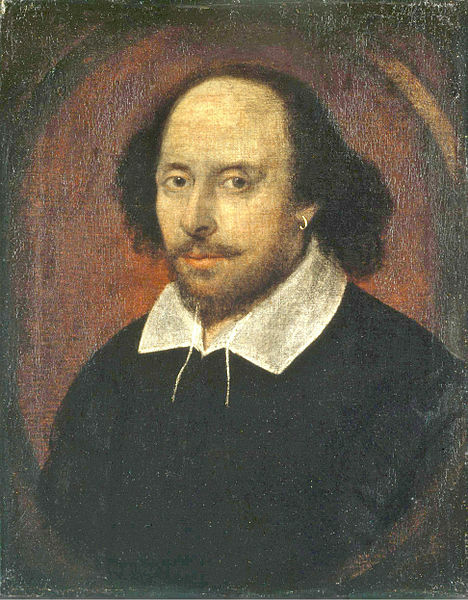 Shakespeare was educated at the local grammar school where the curriculum would have included the study of classical authors, Latin composition and possibly some Greek. He did not go to university. At age 18, he married Anne Hathaway, eight years his senior and pregnant with their first child, Susannah, who was born in 1583. Their twins, Hamnet and Judith, were born in 1585. Sadly, Hamnet died at age 11. Shakespeare’s whereabouts from 1585 until he appeared in London in 1592 are a mystery. But from then on he acted, wrote plays and became a shareholder in a company of players, the Lord Chamberlain’s Men, which on the accession of James I to the throne after the death of Elizabeth I, became the King’s Men. He spent his last years in Stratford and it always amused me that in his will he left his ‘second best bed’ to his wife – until I discovered that the best bed was for guests, and the second-best was the marriage bed. Before I became an expat, I lived in New York City and was lucky enough to have seen Shakespeare in Central Park. One of my theatre programmes from that time shows Meat Loaf in the cast! Another ‘old’ theatre programme from the Royal Shakespeare Company here in the late 1970s lists Ruby Wax in a minor role. Well, you’ve got to start somewhere! Nothing beats seeing Shakespeare on the stage. For those of you who live in or near London, a visit to the Globe Theatre is a must. (www.shakespearesglobe.com). In this replica of the theatre where Shakespeare’s plays were performed from 1599, until destroyed by fire in 1613, you can sit on a cushion on bleacher- like seats or you can brave it as a ‘groundling’ and stand in the central area where you might find yourself interacting with the players. But be prepared with a raincoat as here you are open to the elements. I am proud to say that the prime mover in getting the Globe built was an American, the actor Sam Wanamaker (father of Zoe), who sadly died before its completion. Nearby is the Sam Wanamaker Playhouse, named in his honour. But Stratford-on-Avon is the place where you feel Shakespeare’s presence on every street corner. I first went there as a student, during my ‘Junior Year Abroad’ at Nottingham University. Of course, when I moved to England in the late 70s, I made a beeline for Stratford where I saw several wonderful productions staged by the Royal Shakespeare Company. Over the years, my friends and I have made regular visits to Stratford. We’d drive up on a Saturday, having booked tickets for both the matinee and evening performances. On one insane weekend, when the RSC was performing ‘Henry VI’, Parts I, II and III in the same day, we sat through them all – mid-morning, then matinee, then evening. You really have to be a Shakespeare groupie to do that! Besides the theatres operated by the RSC (the main 1040-seat theatre in Waterside, plus the 450-seat Swan), you can also visit various sites in and around Stratford that are associated with the Bard. Not to be missed are the house in Henley Street where he was born, his wife Anne Hathaway’s cottage and garden, Hall’s Croft (where his daughter Susannah and husband lived) and New Place (which Shakespeare owned during the last years of his life). Also well worth a visit is Mary Arden’s farmhouse, a short drive out of town. Near the main theatre, in Bancroft Gardens, is a large statue of the Bard. He is perched on a pedestal surrounded by smaller statues of Hamlet, Lady Macbeth, Prince Hal and Falstaff. These characters have been chosen to represent Shakespeare’s range and versatility – philosophy, tragedy, history and comedy. Another famous statue of Shakespeare is to be found, quite naturally, in Poet’s Corner of Westminster Abbey. In Holy Trinity Church, where he is buried, the bust of him on the funerary monument is said to be a genuine likeness. For a schedule of plays, see: www.rsc.org.uk. And for a bit of fun, try to see the 1998 film, ’Shakespeare in Love’ which really captures the period – including the tradition that male actors had to play women, the latter being forbidden to appear on the stage. Would the Bard be pleased with all the fuss being made on his account, on this 400th anniversary of his death? Or would he simply dismiss it as ‘much ado about nothing’? One thing’s for certain: All’s well that ends well. When I heard that Brooklyn Bowl had opened in the O2 my initial reaction was one of surprise, as I wasn’t sure that the location fitted with that quirky live music and bowling venue that they have over the pond, but how wrong I was! Most of the venues surrounding the main O2 arena are restaurants solely catering for those going to a show, but a few changes are happening with some outlets bucking the trend by offering an experience without having to have a concert ticket. For those new to the O2 (are there any? ), there was already a cinema in the O2, but now it has a marvellous bowling alley coupled with a good restaurant to while away the hours. This venue also offers live music of its own at times during the week, so check before you go, as the O2 is now so much more than just a large concert hall. We headed to Brooklyn Bowl on a Saturday afternoon, and my wife, my 13 year old daughter and I decided to lock horns down a 60ft lane where the only thing standing between us and glory, were10 large pins seemingly daring us to knock them down. My love of bowling started early in life when I was taken to the local bowling alley by my Dad, and 35 years later I now love taking my own children to this great past time which is fun for all the family. 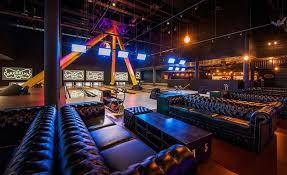 Brooklyn Bowl is definitely the best bowling alley we have been to, as it caters well for kids as well as adults and its ambience and style is a cut above the rest. As you enter the main bowling area the first thing you realise is the size of the area. To your left is a well-stocked bar and to the right the 12 bowling lanes and straight ahead a large screen which, when we arrived, was showing cartoons.The décor is unashamedly retro American and I especially loved the ceiling with its exposed pipework giving the feeling of being in a basement, albeit one with a high ceiling! The first hint that things are different is that, unlike other bowling lanes, you don’t swap your shoes at the entrance, but instead you go to your own luxurious chesterfield sofa by your lane and your bowling shoes are brought to you by your own waiter/waitress. The lanes are modern and the balls shiny and new, but despite all of this help, our bowling didn’t match that quality, but we had a great time trying. When you pay, you pay for the lane, so for £15.95 eight of you can bowl for 1/2hr. To give you an idea of timings the 3 of us bowled 2 1⁄2 games in the hour we had and we had a number of breaks for nibbles and drinks. When I first went bowling the food and drink served could, at best, be described as patchy, but over the years the quality has improved considerably, and at Brooklyn Bowl the food is so good you could be forgiven for forgetting to bowl! The food can be eaten by the lane, in the bar area or in the restaurant, and the menu is so crammed full of delights it is as hard to list them all here as it was to choose them on the day. We decided to eat before the bowling, and although the appetisers looked very good with light and Crispy Calamari (£8.50) or one I will definitely return for, namely the Cajun Prawn Cocktail (£8.50) which sounds intriguing, we passed so we had room for the other courses. The menu is undeniably American, and between us my daughter chose the Mac & Cheese (£8) which, much to my dismay, she declared was ‘infinitely better than the one I cook, as it was creamy and had just the right amount of cheese’, and a side of chips (£4). My wife had the 1⁄2 Rack of Pork Ribs with french fries and coleslaw (£15.95) which even the most blasé of diners would say was enormous. The rich and succulent pork just fell off the bone and was generously covered in a robust bbq sauce and frankly, unless you are ravenous, was plenty for two. I chose a mixed Fried Chicken Platter (mixed being a selection of white and dark chicken) and a side of chips. The chicken is offered in portions of 4, 8, 12, 16 or 24 ranging in price from £10 to £44. I have had fried chicken many times in the UK and all over the US, and this offering compares favourably to the best I have had, with the succulent chicken covered in a delightfully light and crunchy batter perfectly seasoned. As mentioned the pieces of chicken are truly large and a portion of 8 pieces would happily feed 3 hungry people, so beware, as you may find you have ordered too much food. Luckily staff happily provide doggy bags for any left overs (however, please note that if you are going to the O2 after, they don’t allow food into the arena). Desserts were worth leaving room for, with Chocolate Frosted Cupcakes or Becca’s Brownie (£6) well worth a look for those with a penchant for chocolate, although for me, a Hot Fudge Sundae (£6.50) was more to my taste. Brooklyn Bowl also caters for those who want just a few drinks whilst they bowl or listen to the music, including a wide range of beers you would usually find, and a few you that you wouldn’t, including Samuel Adams and Knockdown Punk. The latter has been specially brewed for Brooklyn Bowl London, and is crisp and light with a hint of hops, and was so good it may be worth coming back for on its own. Wines are reasonably priced, and the selection caters for all tastes, palates and price ranges, and although I didn’t try any as we opted for the special beers, the cocktails I saw being prepared looked suitably exotic enough to satisfy even the most discerning of tastes. I love this type of venue as it has something for everyone, from the young to the old, and is so much more than just a bowling alley. The skill which Brooklyn Bowl shows however, is whilst offering all of these different things, each doesn’t infringe or detract from the others. If you just want to bowl you will love it and I, despite my lack of talent, will be visiting again, but will make sure that next time I won’t eat any food with my bowling hand, as I am sure that was the reason for my score! For further information please visit www.london.brooklynbowl.com. 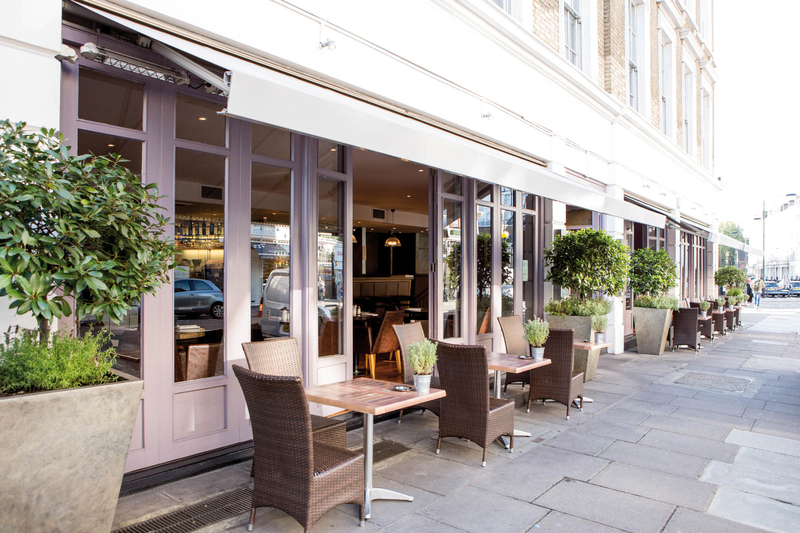 So readers probably know by now that we can accommodate a steak any night of the week - so when visiting Kensington, it would be very remiss of us not to try out a new Brasserie Grill in the area. MK Bar & Grill is located in Mid-Kensington, close to the Royal Albert Hall and conveniently located for the nearby Science, Natural History and Victoria and Albert Museums. This spacious Brasserie has a relaxed vibe. The warm colour palette and contemporary style of décor puts you at ease, making dining here a comfortable and happily informal affair- rather like going to a friend’s house for dinner. The menu features many of my own personal favourite comfort food dishes, and could best be described as falling under the umbrella of ‘contemporary/classic British and European dishes’. There is nothing too showy or fancy here, but I would confidently predict there is something to satisfy every appetite. The starters, ranging in price from £5.25 to £19.50 (sharing Platters for 2), include Chargrilled Calamari, Shredded Duck Salad and Traditional French Onion Soup. I opted for the Jumbo Tiger Prawns (£7.95) in white wine, chilli garlic and lemon. I always find it can be hit or miss with prawns, especially when described as‘jumbo’, which sets an expectation for something impressive; fortunately on this occasion they did not disappoint in their succulence, size and flavour. My companion ordered a starter portion of the Spaghetti Carbonara, which she enjoyed so much she commented it should have been her main course choice! The main course options offer familiar favourites such as: Lasagne, Sausage & Mash, Baked Cod, Grilled Salmon Burger, and a good range of Pasta dishes and Salads – all appetising in their descriptions, and ranging in price from £9.50 to £15.50. That delicious French classic Boeuf Bourguignon (£13.50), served with mash, was my companion’s choice and gave me a brief spell of food envy (until my own main course was served!) The combination of tender chunks of beef with a creamy red wine sauce is comfort food at its best. With the Steak options coming highly recommended, I had opted for the 190g Fillet Steak (£27.50), with my favourite Béarnaise Sauce. Served with Fresh Cut Fries and some Wilted Spinach (£3.95), I was a very happy man! The steak is sourced from Aberdeenshire, from cattle that are naturally reared, grass fed on traditional farms, and then matured for 31 days. You could easily discern the excellent quality of the meat, through its tenderness and flavour: the two things that matter most in a steak. As you’d expect for a Bar and Grill the drinks options are pretty extensive and include a good selection of wines, ranging in price from £18.50 to £70.00. We opted for a standard House Red to accompany our main course choices and were pleasantly surprised by the quality and flavour. There is a mix of traditional and modern cocktails on offer as well as craft beers bottled and brewed in London. Desserts are priced from £4.25-£5.95 and continue the theme of offering comfort classics such as Crème Brûlée with a contemporary edge (theirs has an Espresso and Kahlua twist). I can never resist a Banoffee Pie, but after our generously sized main courses, we were happy to share. Happily, it was deeply filled and wonderfully gooey, as all good Banoffee pies should be! At MK Bar and Grill the service is friendly and laid back, providing a good match with the whole ambience of the place. We found it hard to leave our cosy table on what was a chilly February evening, but next time we’ll go in the summer to enjoy the pavement dining with a hefty side order of sunshine! As the theme tune to a well-known American TV show from my youth said ‘Sunday, Monday happy days, Tuesday, Wednesday happy days, Thursday, Friday happy days, the weekend comes, my cycle hums, ready to race to you’...., and although I wasn’t on“a cycle”, choosing a rather more sedate and sensible saloon, and I didn’t “race”as the speed cameras on our roads are primed to catch those daring to venture over 30 MPH, the tune came totally to mind as I entered Ed’s Easy Diner for the first time. This is now a chain of 50 restaurants which opened in 1987, offering a slice of 1950’s American style service and food across the UK. The décor is straight out of the 50’s with shiny leather seats, cosy booths with each table sporting retro style condiments and a mini jukebox, which enables the diners to select the music being played for 20p a song (all proceeds go to the charity Action for Hunger), and I half expected Biff and Marty McFly or the Fonz himself to plonk themselves down in the next door booth and order themselves one of Ed’s legendary Malt Shakes. What also distinguishes Ed’s from many other establishments selling similar food is that the kitchen is open so you can see your food being freshly prepared, and in some diners actually sit at the counter just like you see in the films/TV. Ed’s Diner sticks to the mantra of doing a few things well rather than trying to be everything to everyone, and so sticks to Burgers, Chicken, Hot Dogs, Salads and a few other favourites, and makes sure they are made from quality ingredients. For example, the burgers are produced from Farm Assured beef and are always fresh, never frozen, and served on their own toasted bun, and the chicken is breast fillet. Diners have two choices when ordering burgers, chicken and hotdogs and can go ‘solo’ where they just get the burger and can separately choose any sides they may wish to order, or having the‘Ed’s plate’where the burger is accompanied by Fries, Onion Rings and Coleslaw, but be warned, the portions are big! For those who don’t fancy a burger or hotdog there are healthier salad options, or those favourites I mentioned earlier that include Ribs (£13.50), Steak (£12.95) and Ed’s Nacho Meat Feast (£13.50), but you really come to Ed’s for the burgers and hotdogs. There is also a dazzling array of options for your chips, seven to be precise, and a more manageable two options for onion rings. Drinks, like the food, follow the American theme with bottomless soft drinks and rich and creamy Milkshakes taking pride of place. All are made with Ed’s own hand scooped ice cream and flavours range from the basic Mint and Chocolate (£4.55) to the more deluxe shakes including Nutella, Lotus Biscoff and my daughters favourite, Oreo (£4.95). Adults are also catered for with Alco-shakes including Dark Rum, and Chocolate and Baileys (£5.65). Those with a sweet tooth are also well catered for if you still have room for a dessert and my personal recommendation is the Kit-Kat Chocolate Sundae, where chunks of Kit-Kat are smothered by creamy vanilla ice cream all generously coated with Hersey’s chocolate (£4.95). 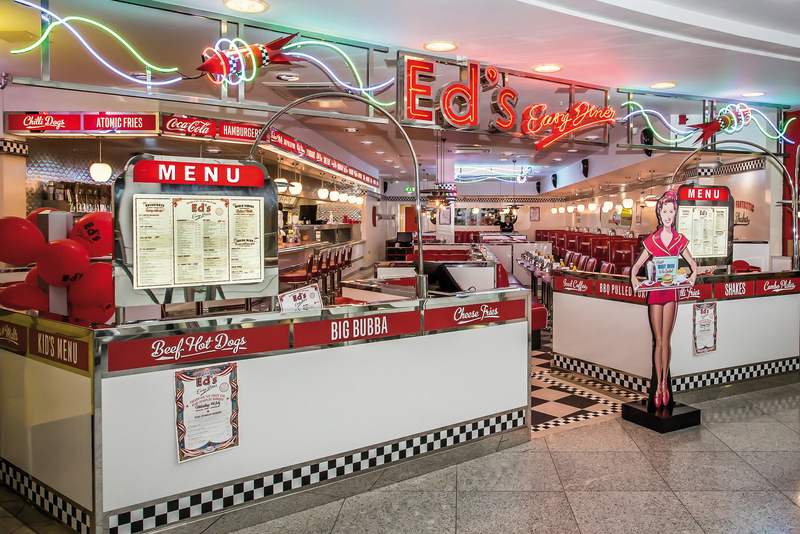 Ed’s Easy Diner is a welcome throwback to the 50’s and its restaurants across the country provide fresh food in a fun environment, and who doesn’t like a little bit of fun now and again in their lives?